Microsoft launched new Dual SIm smartphone with an Affordable price.It has all the apps you love and need like Instagram, whatsAPP and Skype and thousands of more which you like. 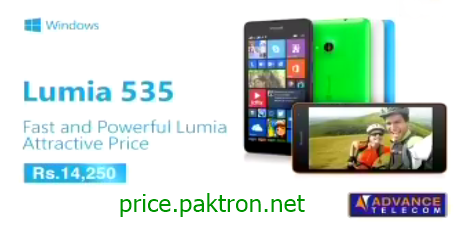 Lumia 535 Dual SIM has the most popular up-and-coming games like Subway Surfers, which will never you getting bored at your spare time.If we are talking about Lumia 535 body it has beautiful from Inside and out side which is Coming packed with premium features.And Microsoft Lumia 535 available in Orange, green, white, black and gray, blue Colors. Lumia 535 Dual SIM Built-in Storage is 8 GB and 15 GB of free OneDrive storage is not enough, bulk up to an additional 128 GB by adding a microSD card. Windows phone has a personal assistant for user called Cortana which powered by Bing.It suggest new apps and other useful recommendations. Always the latest Windows Phone experience. All the apps you love and need. Microsoft Windows Phone 8.1, 8 GB built-in Storage, 1 GB RAM, microSD card (supports up-to 128 GB), 1.2 GHz Quad-core Cortex-A7, Qualcomm Snapdragon 200, GPU: Adreno 302 Processor, Bluetooth version 4.0, A2DP, USB (micro-USB version 2.0), WLAN, GPRS, EDGE, 3G, 5.0 inches screen size with 540 x 960 pixels, IPS LCD capacitive touchscreen, 16 Million colors, Multi-touch, Corning Gorilla Glass 3, with Sensors: Accelerometer, proximity, DUAL SIM, FM Radio, Audio/Video Player, GPS+AGPS, Speaker Phone. 5 Mega-Pixel Rear Camera with 2592 x 1936 pixels and Features: autofocus, LED flash, 1/4-inches sensor size, geo-tagging, Video Recording at (480 pixel @30fps) and also find 5 Mega-Pixel Front Camera with Wide-Angle.